Zileri dal Verme Collection, Palazzo Loschi, Venice. Count Camillo Zileri dal Verme (d.1894) by descent to Count Roberto Zileri dal Verme and family. David Alan Brown. "Berenson and Mrs. Gardner: The Connoisseur, the Collector and the Photograph." Fenway Court. (1978), p. 24, fig. 1. Hilliard Goldfarb. Imaging the Self in Renaissance Italy. Exploring Treasures in the Isabella Stewart Gardner Museum III. Exh. cat. (Boston: Isabella Stewart Gardner Museum, 1992), pp. 39-42. Cynthia Saltzman. Old Masters, New World: America’s Raid on Europe’s Great Pictures (New York: Penguin Books, 2008), p. 80. In the late fifteenth century, new types of private devotional pictures emerged in Italy. This painting is innovative in its depiction of strong emotion to aid prayer and meditation. The subject has been excerpted from narrative representations of Christ carrying the cross to Mount Calvary. However, lacking distracting details or any indication of setting, this image focuses instead on the tear-streaked face of Christ, who stares out at us melancholically, as well as the knotty wood cross over which he casts a shadow. It is an intimate and intensely personal depiction of a suffering more emotional than physical. This type of dramatic close-up was perfected by Giovanni Bellini, who was influenced by devotional images derived from the work of Leonardo da Vinci. This work is in turn based on a composition by Bellini (recorded in a painting in the Toledo Art Museum), and was made by a close follower of the artist, perhaps Vincenzo Catena (ca. 1470–1531). 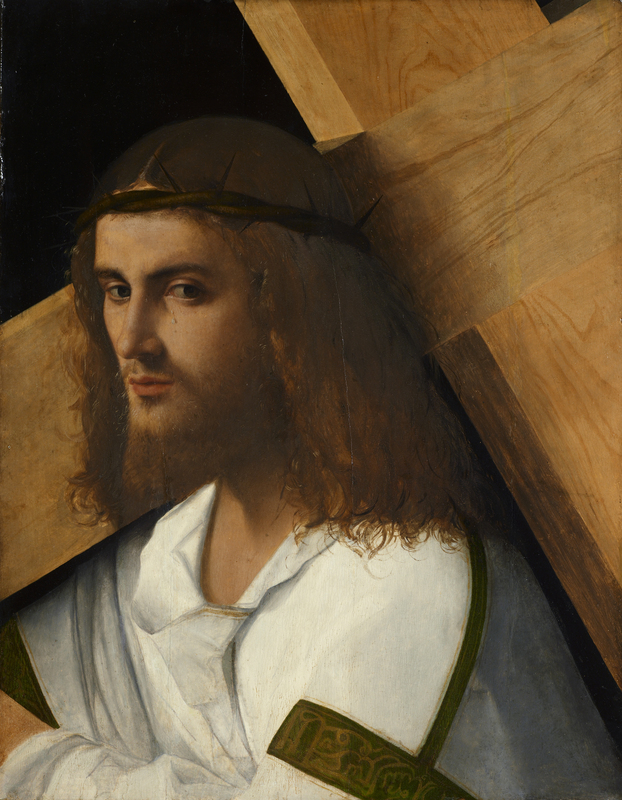 When Isabella Stewart Gardner purchased the painting in 1896, it was attributed to Giorgione, who was also pupil of Bellini and documented as a colleague of Catena. Even at that time, Gardner was unsure about its authorship, although the painting’s strong quality and stirring piety led her to buy it. Bernard Berenson was frankly surprised that Gardner wanted such a strongly religious work. According to Morris Carter, the first director of the museum, the painting was Mrs. Gardner’s favorite, and she often placed a vase of violets in front of it, a tradition maintained by the museum. Source: Alan Chong, "Christ Carrying the Cross," in Eye of the Beholder, edited by Alan Chong et al. (Boston: ISGM and Beacon Press, 2003): 99.